The Ultimate Guide to Photography is aimed at those looking to take their photography to the next level by learning skills and techniques for a variety of subjects. 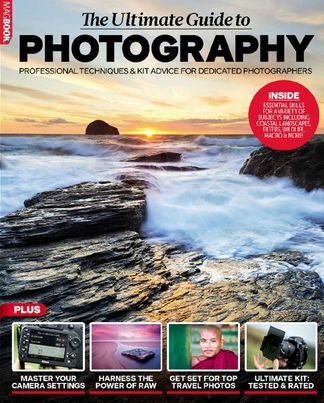 It is packed with expert advice from many of the UKs leading professional photographers, with emphasis on key in-camera techniques rather than post-processing techniques. With topics covering everything from macro to travel to coastal landscapes, the photographic possibilities are wide and varied. We also bring you our choice of photo equipment to suit the topic, while at the rear you will find an extensive set of reviews to ensure you get maximum value by choosing the best kit for the job. Be the first person to tell us what you think about Ultimate Guide to Photography and you'll save $5 on your next purchase!